The first day of the training course was devoted to the presentation of the project and the various speakers. The tools required for the realization of the workshop were installed on a machine. The goal being that these tools should be set up on the network by the participants themselves, so that not only they would use them but also to know where to find them and how to install them on a computer. A first approach of the aesthetic and functional aspect of the device to be built, was then undertaken. 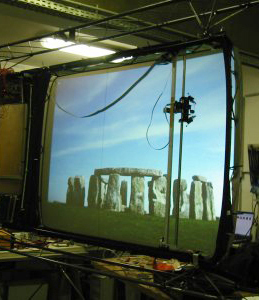 Tuesday was devoted to the installation, the use and the training of Pure Data. The participants, through simple examples and exercises, performed basic patches allowing the understanding of Pure Data 'philosophy'. The end of the day was devoted to the implementation of the driving of PicoIP cards starting from Pure Data over the network..
PHP and the dynamic pagination were the theme of Thursday morning. After installing EasyPHP, the evaluation server to produce a Web server on a computer, the students discovered through the basis of the language how to customize the contents of a Web site according to external data. The basis of the data exchange between applications were raised, in particular, the exchange of information between PHP and Pure Data in a system which is driven by Pure Data. Thursday afternoon was the starting point of the applications specific to the project. Groups were formed, a group working on the construction of the Web site, the visible part of the system, the other group working on Pure Data, the hidden part to ensure the driving of the device with 2 PicoIP cards. The structure that was being built over the week was installed. The final part of the assembly during the morning, that was wiring the devices and piloting tests from Pure Data to ‘debug’ the patches. The afternoon was devoted to the installation of the video-projector to broadcast images onto the device, and to the implementation of the whole system. Diffusion of Web page onto the device, exchange of information between the Web site and Pure Data, piloting of the device from Pure Data via the PicoIP cards.